In Arabic, a genie (also jinn, jinni, djinni, from Arabic جني jinnī) is a supernatural creature which occupies a parallel world to that of mankind, and together with humans and angels makes up the three sentient creations of God (Allah). According to the Qur’ān, there are two creations that have free will: humans and jinn. Religious sources don't mention much about them; however, the Qur’an mentions that jinn are made of smokeless flame, and they form communities just like humans, and, just like humans, they can be good or evil. Jinn is a word of the collective number in Arabic, derived from the Arabic root j-n-n meaning 'to hide' or 'be hidden'. Other words derived from this root are majnūn 'mad' (literally, 'one whose intellect is hidden'), junūn 'madness', and janīn 'embryo, fetus' ('hidden inside the womb'). The word genie derives from Latin genius, which meant a sort of tutelary or guardian spirit thought to be assigned to each person at their birth. English borrowed the French descendant of this word, génie; its earliest written attestation in English, in 1655, is a plural spelled "genyes." The French translators of The Book of One Thousand and One Nights used génie as a translation of jinnī because it was similar to the Arabic word in sound and in meaning. This use was also adopted in English and has since become dominant. The Arabic root j-n-n means 'to hide, conceal', as in the verb janna "to hide, conceal". A word for garden or Paradise, جنّة jannah, is a cognate of the Hebrew word גן gan 'garden', derived from the same Semitic root. In arid climates, gardens have to be protected against desertification by walls; this is the same concept as in the word paradise from pairi-daêza, an Avestan word for garden that literally means 'having walls built around'. Thus the protection of a garden behind walls implies its being hidden from the outside. 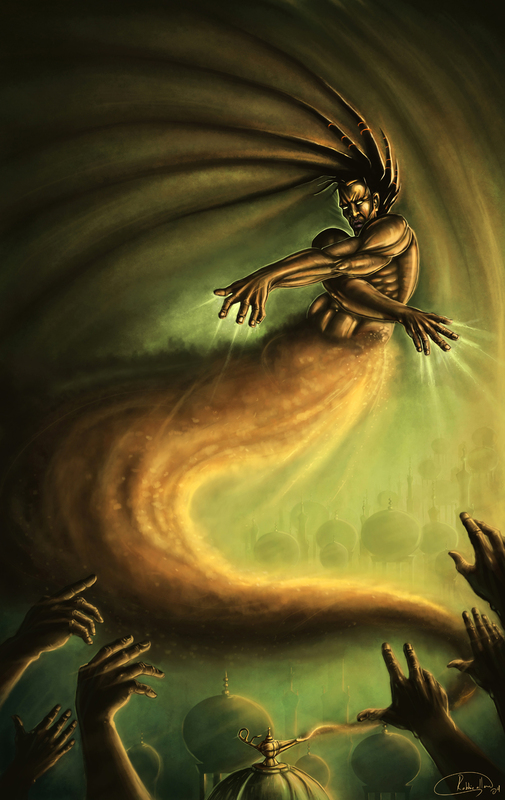 Arabic lexicons such as Edward William Lane's Arabic-English Lexicon define jinn not only as spirits, but also anything concealed through time, status, and even physical darkness. In Arabic, the word jinn is in the collective number, translated in English as plural ("genies"); jinnī is in the singulative number, used to refer to one individual, which is translated by the singular in English ("genie"). In other cultures also, such as in Guanche mythology from Tenerife in the Canary Islands, there existed the belief in beings that are similar to genies, such as the maxios or dioses paredros ('attendant gods', domestic and nature spirits) and tibicenas (evil genies), as well as the demon Guayota (aboriginal god of evil) that, like the Arabic Iblis, is sometimes identified with a genie. The Guanches were of Berber origin in northern Africa, which further strengthens this hypothesis.